We designed two vertical windows with a centered skylight to expose more natural light in the standing area. We also designed a doorless shower with dual entries, floating sink with twin mirrors, and XL tub. The shower features a black-edge detail to define the shower with the rest of the room. Slate finishes complete the look. This master bathroom boasts nearly 300-square feet, and is somewhat of a great room. 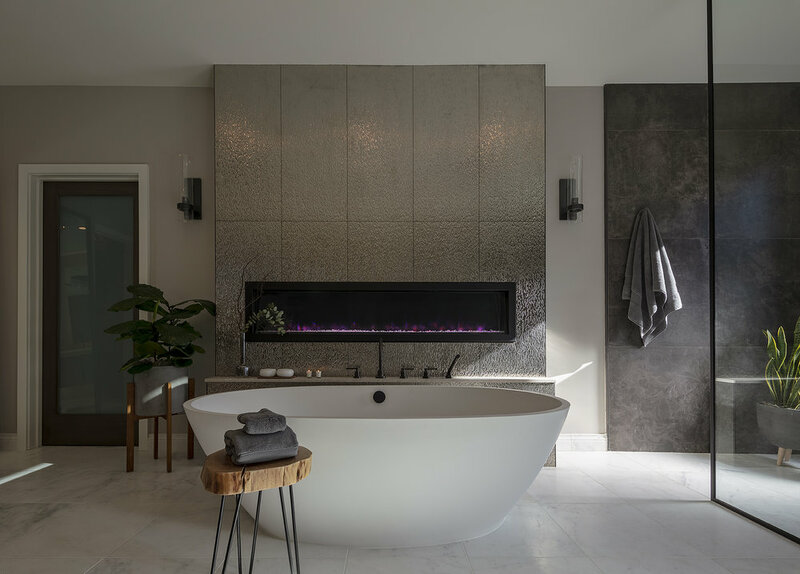 A 72-inch fireplace marries beautifully with the oval tub. Natural stone and wood, combined with a tasteful selection of gray, white and onyx bring an elevated, modern look to the space.